Yesterday was a busy day so I wasn’t able to log in until night time. 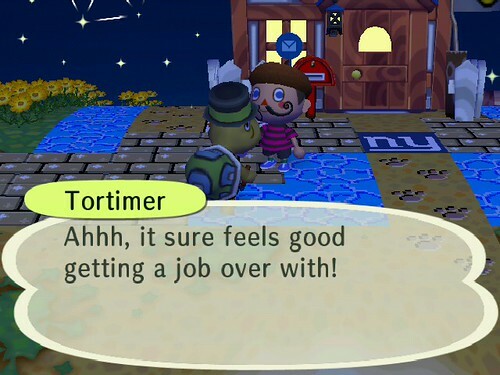 But I was very excited about it, because I knew Tortimer would be waiting for me! 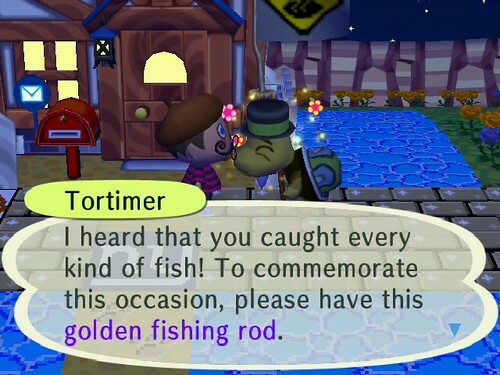 It was time for the Golden Fishing Rod Ceremony, held in front of Squirt’s house. Gimme that Golden Fishing Rod! I was very happy to accept this fabulous prize, even though I’d gotten one through the black market last year. A part of me was kind of sad, since now Squirt won’t be getting any further surprise visits from the mayor. It seems that Tortimer, however, was glad to have completed his chore for the day. He's a lazy old fart. A new neighbor finally moved in! He’s a blue Jay. Great, now I have two BIRDS in Shaolin. Although Jay is a rather small little guy, and Apollo is a huge eagle. But still, birds all the same. We’ll see how long Jay lasts. I do have to say that I was very pleased with his house placement – he moved next door to Elise, in a completely unchartered area for a house! He lives in the space just south of Nookington’s. I was very glad to only add one footprints tile to connect his home to the main road. 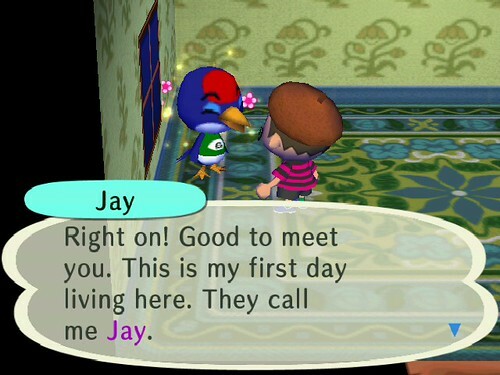 Thanks for choosing a different spot than usual, Jay! After Miao left, I realized that the mail had arrived, full of items I’d ordered from Nook to help Vella with her own catalog. 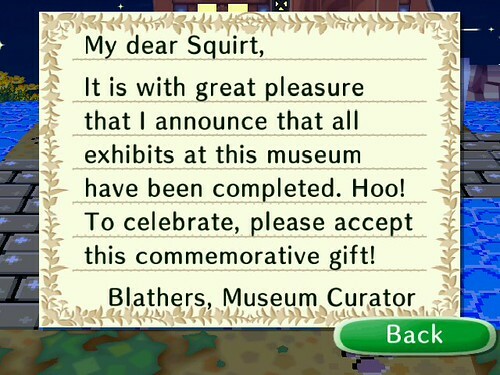 Then I found one letter I hadn’t expected – a notice from Blathers??!?!?! Honestly, I really wasn’t expecting anything from Blathers, other than the wonderful speech I posted yesterday. So imagine my surprise when I received this letter, with a present attached! Included was the Museum Model, which I’ve been needing to finish my “miniature town” room. (That room has been under construction for a while, and is currently being used as bug storage.) Strangely, the Prima Guide says that the Museum Model can be obtained as a Spotlight Item through Nook’s store. Now I’m pretty sure that information is incorrect. The guide also says the Town Hall Model can be found as a Spotlight Item… and I’m having doubts on the validity of that as well. 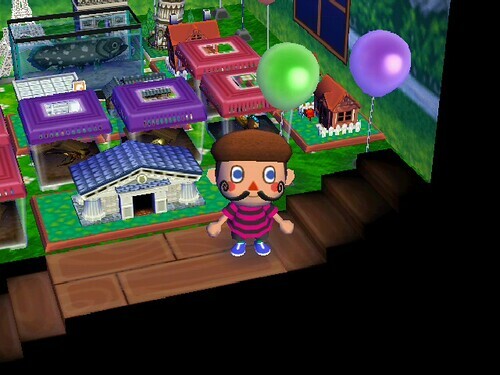 Does anyone know the actual way to get the Town Hall Model? Maybe you have to donate enough money to get all the feathers? If anyone can shed some light on this subject, please post a comment or email me! Thanks! Thanks Sarah! Let me know your friend code so I can add you!